Kick. Glide. Kick. Glide. I had forgotten how cathartic the rhythm of cross-country skiing can be. My husband Jack and I had just left the Jackson Ski Touring Center’s lodge, eager for some exercise and to see some new terrain. Though I had alpine skied in the Mount Washington Valley many times and often stayed in the village of Jackson, this was my first time exploring the touring center’s extensive trail network. The snow conditions were what could be described as crispy-New England-traditional. Ten inches of new snow had blanketed Jackson followed by two days of rain. Then the temperature dipped below freezing the night before our arrival. The sunshine made up for the challenges of the track, which was fast but still enticing. 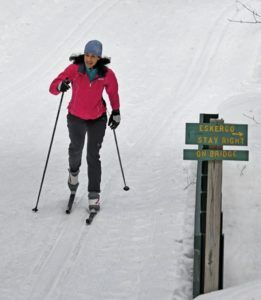 The Jackson Ski Touring Center (JSTC) also grooms its trails daily, which gave the conditions a significant boost. Our skis skimmed effortlessly along the parallel grooves in the crystalline snow. A Monday in early February, we had the place to ourselves. Deb Deschenes, JSTC’s marketing, sales, and events manager and one of the center’s two full-time employees (there are 25 seasonal ones, too), suggested we try the Ellis River Trail to Cocoa Cabin. To get there, our route started on what is a golf course during the summer. I was grateful for the flat warm-up. 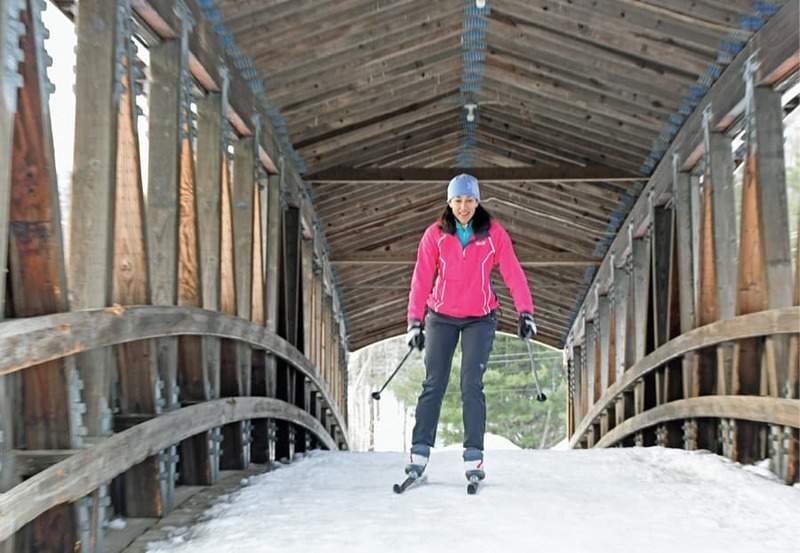 We skied through an iconic red covered bridge over the partially frozen Ellis River. At the halfway point on the bridge, we paused to admire a short section of the river, a tributary of the Saco River that flows off the eastern side of Mount Washington. Pillows of snow and pockets of open water melded with flowing ice in a wintry patchwork down the middle of the river. After we skied off the other side of the bridge, we went through a short underpass. We took our skis off briefly to cross a road in a quiet neighborhood and then walked around a gate by the village water plant. From there, we continued on skis along the river on a broad, white corridor below bushy hemlocks and naked oaks and birches. Rays of sunlight touched the trail here and there, highlighting an acorn or brown leaf that had drifted there since the groomer had passed by. All was serene. We traversed a short bridge, then came upon an instructor without students, taking advantage of the chance to enjoy some ski time on her own. “This trail is a super highway, very popular on weekends,” she said. We were glad for the chance to experience it at a more peaceful moment. As we neared our destination—Cocoa Cabin—we came to one of the storybook trails. 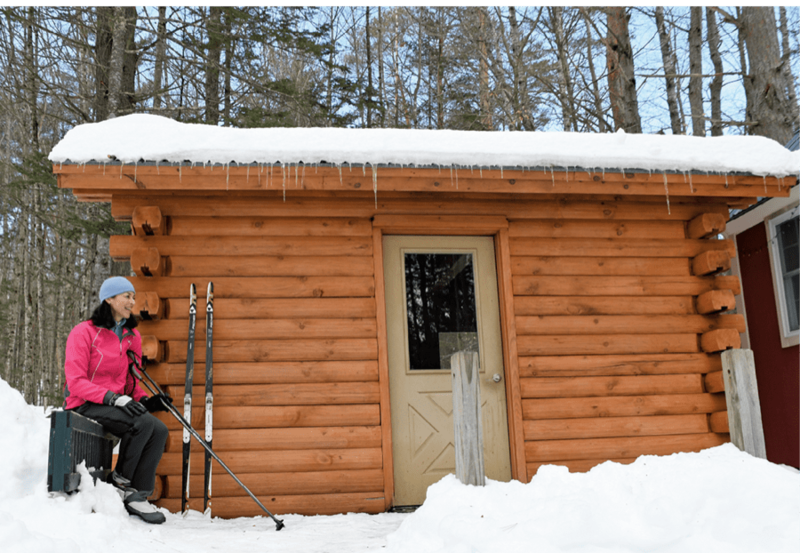 Story Land—a local children’s theme park—the Jackson Library, and JSTC partnered together to create two cross-country ski and snowshoe-friendly trails: a one-kilometer loop by the library and the Ankle Biter section of the Ellis River Trail. You can ski and read a children’s story at the same time, in this case, The Snowy Day by Ezra Jack Keats. The idea is to read a book and get some exercise. (Kids under age 10 ski free at JSTC.) As an added bonus on weekends and during holidays, you can warm your hands and toes by the firepit and sip hot cocoa by the cabin. On this quiet Monday, the cabin was deserted, but we still smiled at the story and appreciated this clever way to encourage families to get outdoors during the winter. The storybook trails were made possible through a $5,000 grant from Story Land and the library to the Jackson Ski Touring Foundation. The foundation is a community-based nonprofit organization chartered to maintain trails in and around the village of Jackson, New Hampshire. It was formed in 1972 in the living room of the Christmas Farm Inn & Spa, one of a number of lodges and restaurants along the JSTC’s 154-kilometer trail system, which by coincidence, was where Jack and I stayed. The Christmas Farm Inn & Spa dates back to 1778 when it was a true farmhouse. Its name was bestowed shortly after the Great Depression when a Philadelphian gave the property to his daughter as a Christmas present. Though it was a working farm and a jail at various times during its long history, this historic inn now mixes traditional New England charm with a classy spa, exceptional restaurant, and luxurious rooms. While relaxing in the living room of the main house, I could easily imagine local business owners and skiers gathered there to plan the touring center as a way to support the local economy. Unlike the alpine resorts in the area that make snow, JSTC depends entirely on Mother Nature to cover its trails. Sometimes she cooperates, and sometimes she doesn’t. The village gets an average of 60 inches of snow per year. Jackson had already received that much snow by mid-February when we were there, but the winter before, they had only six inches for the entire winter. 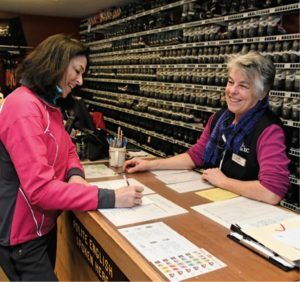 “We do the best with what we get,” Deb explains. “We farm it. Even the snow off the roof of the lodge gets spread on the trails. After it rains, we don’t touch the snow. We let the water go through it. It refreezes, then we till it with the groomer. It’s a science.” If managing natural snowfall is a science, then JSTC is the Einstein of snow. Its trail system is considered one of the finest in the United States. And it’s a full-service touring center that offers tours, lessons, children’s after-school programs, physical education classes for local elementary-age children, race volunteer workshops, free use of sit-skis for disabled skiers, training for disabled skier-guides, waxing demonstrations, programs to combat obesity, and the simple pleasure of gliding on snow. On our second day, Jack and I checked out the trails that start at Woodchuck Fields on Carter Notch Road. The snow softened as the sun climbed above us and warmed the day to a pleasurable 35 degrees. As we skied across this expansive meadow covered by its winter blanket, we truly came to appreciate what JSTC has to offer, which is just about everything you could want on a Nordic getaway. You can ski, eat, and sleep without getting in your car until it’s time to go home, which was tough to do after such an enjoyable, invigorating two days. Jackson is truly a rare gem. A persistently traditional New Hampshire small village, Jackson is nestled into a valley that lives just beneath the shadow of Mount Washington along Route 16. That said, if you are speeding up Route 16 toward Pinkham Notch, its entirely likely that you’d miss this lovely little spot without realizing it. The village proper is found after taking a right off 16, passing through Jackson’s classic covered bridge—known as the Honeymoon Bridge—and then easing along its main street. A series of inns, stores, homes, the village green, and a modest golf course line the roadway. Around and above you, Mount Washington as well as several smaller mountains create the most enticing valley-like feel. In and around Jackson you will be able to step back in time to an older, simpler version of New England. The Eagle Mountain House, built in 1916, is one of only a handful of surviving grand resort hotels in the White Mountains. It’s also home to its own links golf course carved from what used to be grazing pasture for the hotel’s livestock in 1920. The above listed inns also offer a range of dining options, but we would also recommend Thompson House Eatery in the heart of Jackson and the Shovel Handle Pub. The latter of these lives in a converted, three-story post and beam barn and has views of nearby Black Mountain, which comes as close to traditional New England skiing as one can get without hiking up to Tuckerman’s Ravine. And then there’s the Shannon Door Pub & Restaurant. This is a lovely and lively place to have a simple, pub-style meal, a few drinks, and listen to great, live acoustic music with locals and visitors. On a Saturday night, this is one of the best places to be. If you happen to see Kevin Dolan performing—he’s a Mount Washington Valley acoustic institution—say hello. He’s a fine Irishman. 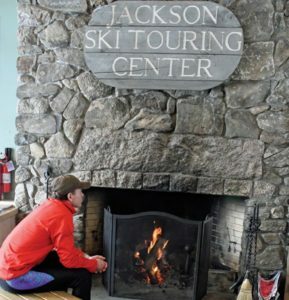 Jackson Ski Touring Center is one of the finest cross-country skiing locations anywhere, but it’s not the only traditional New England ski area in and around Jackson. For those who are looking for a backcountry experience there is the Granite Backcountry Alliance at granitebackcountryalliance.org. They manage a range of glades and host several backcountry outings throughout the winter, among other activities. *The back of Wildcat offers one of the most challenging and beautiful backcountry ski trails in all of New England. Skiers can purchase a single-ride ticket, take the lift to the top, and ski the back side.